What separates Generation Y from X, and is Generation Z a thing? How old is each generation? Are they really that different? It’s easy to see why confusion about generational cohorts abounds. If you’ve ever felt muddled by this "alphabet soup" of names…you’re not alone. The real frustration hits when you realize that Gen Y consumers will earn 46% of income in the U.S. by 2025.1 And unless you understand who they are and what they want, you won’t capture a dollar of their money. Furthermore, as one generation’s spending power decreases (i.e. Boomers) another is increasing. A common source of confusion when labeling generations is their age. Generational cohorts are defined (loosely) by birth year, not current age. The reason is simple: as people age, they change life stages. For example, a member of Generation X who turned 18 in 1998 would now be nearly 40. In that time, he or she cares about vastly different issues and is receptive to a new set of marketing messages. Regardless of your age, you will always belong to the generation you were born into. 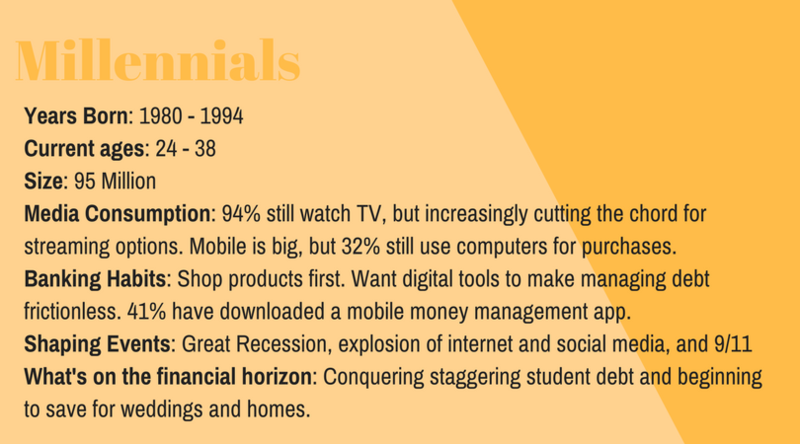 Gen Y: Gen Y, or Millennials, were born between 1980 and 1994. They are currently between 25-39 years old. 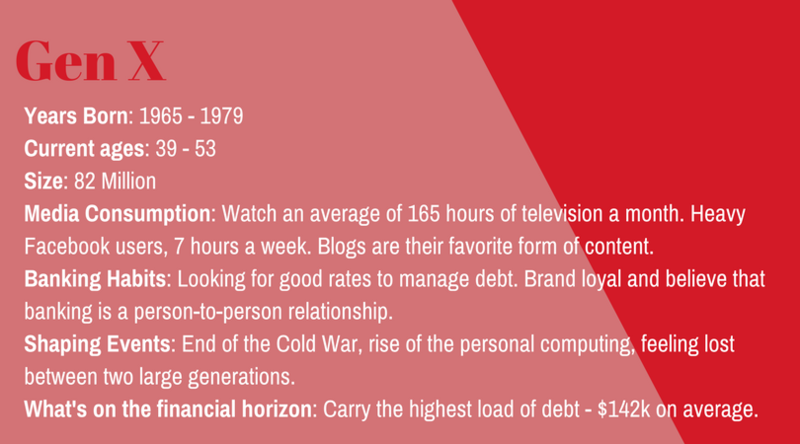 The term “Millennial” has become the popular way to reference both segments of Gen Y (more on Y.1 and Y.2 below). Realistically, the name Generation Z is a place-holder for the youngest people on the planet. It is likely to morph as they leave childhood and mature into their adolescent and adult identities. Why Use Letters at All? It all started with Generation X, people born between 1965-1979, approximately. 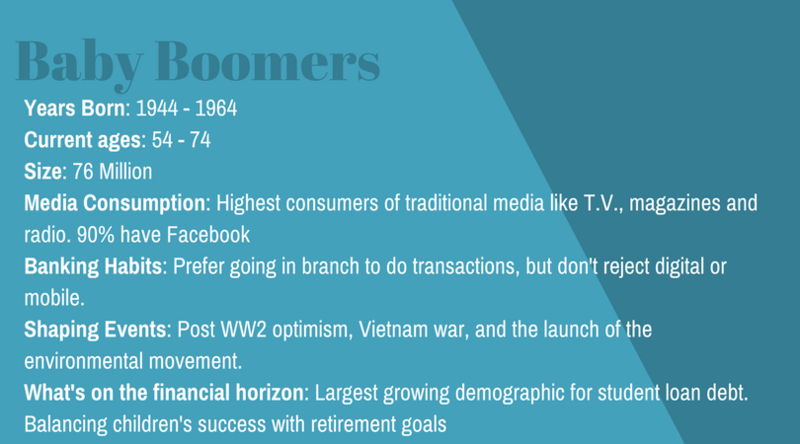 The preceding generation was the Baby Boomers, born 1944-1964. Post World War II, Americans were enjoying a new-found prosperity, hence the "baby boom." But the generation that followed this didn’t have a blatant cultural identifier. In fact, that’s the anecdotal origin of the term Gen X — illustrating the undetermined characteristics they would come to be known by. Depending on whom you ask, it was either sociologists, a novelist, or Billy Idol who cemented this phrase in our vocabulary. From there on it was all down-alphabet. The generation following Gen X naturally became Gen Y, born 1980-1994 (give or take a few years on either end). The term “Millennial” is widely credited to Neil Howe, along with William Strauss. The pair coined the term in 1989 when the impending turn of the millennium began to feature heavily in the cultural consciousness. Why Bother Splitting Up Gen Y? The Financial Brand has reported on three costly myths associated with Gen Y. In the article, Javelin Research used Gen Y.1 and Gen Y.2 to highlight an important distinction within the cohort. Not only are the two groups culturally different, but they’re in vastly different phases of their financial life. The younger group are financial fledglings, just flexing their buying power. The latter group has a credit history, may have their first mortgage and are raising toddlers. The contrast in priorities and needs is vast. Marketing to them as a single cohort will not be nearly as effective as segmenting your strategy and messaging. Why Are the Names Important at All? In practice, each generation label serves as a short-hand to reference nearly 20 years of attitude, motivations, and historic events. Few individuals self-identify as Gen X, Millennial, or any other name. They’re useful terms for marketers and have a tendency to trickle down into common usage. Again, it’s important to emphasize that referring to a cohort simply by the age range gets complicated quickly. 10 years from now, the priorities of Millennials will have changed — and marketing tactics must adjust instep. Whatever terminology you use, the goal is to reach people with marketing messages that are relevant to their phase of life. In short, no matter how many letters get added to the alphabet soup, the most important thing you can do is seek to understand the soup du jour for the type of consumer you want to attract. Before we dive into each generation, remember that the exact years born are often disputed, but this should give you a general range to help identify what generation you belong in. The other fact to remember is that new technology is typically first adopted by the youngest generation and then is gradually adopted by the older generations. As an example, 95% of Americans have a smartphone, but Gen Z (the youngest generation) is the highest user. Media Consumption: Highest consumers of traditional media like television, radio, magazines, and newspaper. However, 90% have a Facebook account. Banking Habits: Prefer to go into a branch to do transactions. Shaping Events: Post WWII optimism, the cold war, and the hippie movement. What's next on their financial horizon: Unexpectedly, this generation is experiencing the highest growth in student loan debt. They have a belief that you should take care of your children enough to set them on the right course but don't plan on leaving any inheritance. Media Consumption: Gen X still reads newspapers, magazines, listens to the radio, and watches TV -- about 165 hours worth of TV a month. However, they are also digitally savvy and spend roughly 7 hours a week on Facebook. Banking Habits: Since they are digitally savvy, Gen X will do some research and financial management online, but still prefer to do transactions in person. Believe banking is a person-to-person business and exhibit brand loyalty. Shaping Events: End of the cold war, the rise of personal computing, and feeling lost between the two huge generations. What's next on their financial horizon: Gen X is trying to raise a family, pay off student debt, and take care of aging parents. These demands put a high strain on their resources. The average Gen Xer carries $142,000 in debt. They are looking to reduce their debt while building a stable saving plan for the future. Media Consumption: 95% still watch TV, but Netflix edges out traditional cable as the provider. Cord-cutting in favor of streaming services is the popular choice. This generation is extremely comfortable with mobile devices but 32% will still use a computer for purchases. They typically have multiple social media accounts. Banking Habits: Millennials have less brand loyalty than previous generations. They prefer to shop product and features first and have little patience for inefficient or poor service. Because of this, Millennials place their trust in brands with superior product history such as Apple and Google. They seek digital tools to help manage their debt and see their banks as transactional as opposed to relational. What's next on their financial horizon: Millennials are entering the workforce with high amounts of student debt. This is delaying major purchases like weddings and homes. Because of this financial instability, Millennials prefer access over ownership which can be seen through their preference for on-demand services. They want partners that will help guide them to their big purchases. Media Consumption: The average Gen Zer received their first mobile phone at age 10.3 years. Many of them grew up playing with their parents' mobile phones or tablets. They have grown up in a hyper-connected world, and the smartphone is their preferred method of communication. On average, they spend at least 3 hours a day on their mobile device. Banking Habits: This generation has seen the struggle of Millennials and has adopted a more fiscally conservative approach. They want to avoid debt and appreciate accounts or services that aid in that endeavor. Debit cards top their priority list followed by mobile banking. Over 50% have not entered a bank branch in at least 3 months. Shaping Events: Smartphones, social media, never knowing a country not at war, and seeing the financial struggles of their parents (Gen X). What's next on their financial horizon: Learning about personal finance. They have a strong appetite for financial education and are opening savings accounts at younger ages than prior generations. 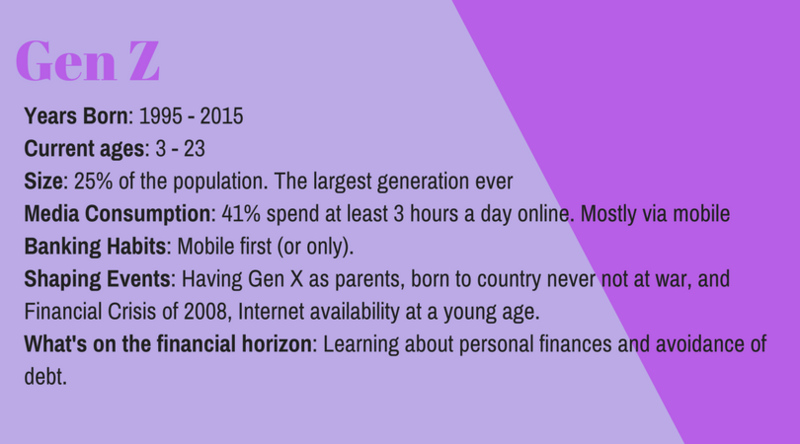 If you want to know more about Gen Z, check out this deep dive into their media consumption and banking habits. Absolutely, and for several reasons. Each generation has been in the workforce for different lengths of time and accumulated varying degrees of wealth. Each generation is preparing and saving for different life stages; be that retirement, children's college tuition, or buying a first car. Each generation grew up in evolving technological worlds and has unique preferences in regard to managing financial relationships. Each generation grew up in different financial climates, which has informed their financial attitudes and opinions of institutions. Now that you understand some of the key differences in media consumption and banking behavior across the generations, wouldn't it be great to know the makeup of the communities you serve? Kasasa is offering a free personalized Market Insight Report that will detail generation distribution in your communities as well as income, banking behavior, and share of deposit information. Request your version here. Previous What Generation Comes After Millennials? Meet Gen Z. Next Can You Change A Consumer’s Financial Behaviors?